With no real plans for New Year's Eve, I recalled that last year, I had used it as an opportunity to load up Elder Scrolls Online for the first time in ages. So I thought to myself: Why not make a tradition of that? Just give it a few hours to patch and perform the mandatory repair (because for some reason the game seems to like breaking itself while I'm not playing), and I should be good to go. ESO remains the one MMO that I feel I should really like more than I do, due to its similarities to SWTOR in terms of lore focus, voice acting, other players with similar taste as me liking it etc. but somehow it never quite clicks. Still, nothing wrong with taking it for another non-committal spin, right? I had forgotten that I'd left my cat person at level seven wearing an utterly hideous helmet, but I did remember that I still had Kenarthi's Roost (whose name I just had to google to find out what it's really called, because apparently I had horribly mangled it in my head) left to finish up, so I did that. It was okay I guess. During the last quest in the main chain, when you're supposed to "escape the area" with some urgency, I got distracted by a fishing hole and started fishing, which quickly gained me several achievements. I knew that urgency was a lie anyway. Then I tried to go for a swim and was killed by "slaughterfish", resulting in another achievement and me having to run back inside the instance just to be able to escape from it properly. I wasn't really feeling it yet at this point, but then I hit level eight and saw that they had introduced some level up rewards since the last time I played, which also hint at things that you will get later, and saw that at level ten I was going to get a free horse. Free horse! I still vaguely recall all the hubbub about the game's collector's edition coming with an exclusive horse back in the day, so the times have clearly changed a lot. Anyway, that served as a motivator for me to press on. As this also marked the point where I was finally entering territory that I hadn't already seen back in the beta, I actually found myself getting somewhat drawn into the main storyline, despite of being constantly addressed as "Vestige". What am I, an appendix? If there is a good lore explanation for this, feel free to enlighten me in the comments, but I still think that it's a stupid-sounding title. Also, the prophet is worse than General Garza and her constant requests for troopers to go back to Coruscant. He kept telling me that I should go because he needed to meditate or something like that, and as soon as I was two steps out of his cave his spectral form would pop up in front of me and call me right back. Seriously, every time. I'm hoping that this an accidental side-effect of the way I'm playing or an unintentional leftover from previous questing changes, because it's really awkward. At level ten I got my horse though. Hurrah! And then was promptly defeated by ESO's UI. 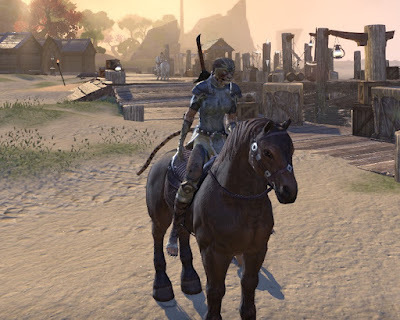 I didn't think I'd ever have to google something like "how do I summon my mount in ESO" but that's what I ended up doing, because the in-game help pages unfortunately were of no help. Apparently the answer is that you press H for horse, which probably made sense to someone somewhere. I don't know, from a distance all Bethesda games kind of look the same to me, so maybe there is a certain consistency there and they just expect people to know how everything works. As someone who hasn't played any other games from the studio I often feel a bit lost though. You can recognise the noob by her mismatched armour and free starter horse. I was also kind of surprised by how "needy" the game is these days, considering that it's buy to play with some subscription encouragement. Apparently there are daily log in rewards now; when you want to research something it takes a long time and you can only run one research project per skill at a time, and to fully train up your riding skill you're apparently supposed to visit the riding trainer once a day for half a year to queue a new training session each day. These "make sure to log in every day just to press a button" tactics are something I tend to associate more with free-to-play titles. Shortly after I acquired my horse, I also had my first ever interaction with another player, and it was super awkward. I had this quest that required me to enter a certain area, but a guard was rebuffing and blocking me. I thought I'd try to sneak past. I failed, but since I hadn't really done much sneaking before, I re-tried a couple of times just to make sure I wasn't doing it wrong. Someone else saw this and started whispering me that I was doing it wrong and should follow him instead, switching to all caps and then /yelling when I didn't immediately respond. This made me so embarrassed that I just ran away and did something else entirely for a bit. It's funny because I'm 100% convinced that this person was just trying to be helpful but I felt uncomfortably judged for being a noob and just wanting to figure things out on my own. The storyline continues to be somewhat interesting, though for some reason I really struggle to remember the names of characters and places - the naming conventions in Tamriel just don't work for me, and while you can sometimes ask questions about things in the dialogue options, the game generally seems to assume that you're already somewhat familiar with the world of the Elder Scrolls, name-dropping important characters, concepts and places like there's no tomorrow, which can cause me to zone out a bit. It's an interesting contrast to WoW, where I also had no knowledge of the IP when I started playing back in 2005, but a lot of the early vanilla quests were designed around giving you a basic idea of the culture your character lived in. Also, the degree of importance bestowed on your character based on very little whatsoever is almost comical. Redbeard wrote a post on this subject recently but made it about MMOs in general, and my reaction was: "Okay, but in how many games does this actually happen?" Okay, so ESO is where it happens. I still can't believe I went to personally warn the queen of the Aldermarimeri Dominion of an assassination attempt against her and was then elevated into the position of one of her personal besties within about five minutes. Combat is a mixed bag, as I'm not a huge fan of the style of action combat. I was kind of impressed when I suffered my first "real" death (not counting the slaughterfish) fairly early on, from one of the raptor-like things (again, don't ask me about names). Up until then everything had been a cakewalk, but then that thing just kept knocking me about to the point that I could barely scratch it before dying. Fortunately that particular challenge was easily overcome by using my stun breaker and block more effectively, but the overall flow of combat still feels kind of clunky to me. Anyway, I made it to level 11 before I logged off for the evening and enjoyed puttering about enough that I also got myself certified in all the (default) crafting skills. Same thing again next year I guess? The biggest gripe for me is that while the voice acting itself is good, it doesn't sound like the sentences flow very well. One thing that Bioware has gotten completely right in SWTOR is that the voice acting sounds like people talking, rather than people talking slow enough for people to read the dialogue. ESO is definitely the latter, although there are some times when I wish the character you're talking to would be more physically expressive to go with, ahem, talking faster. For what it's worth, I only figured out the "H" for mount about two weeks ago. I honestly didn't care up until that point, because I learned the hard way (the SWTOR vanilla planets) that if you were dismounted and entered into a new zone, your companion might say something interesting and/or funny. Oh, and thanks for the shoutout, but it also happens in LOTRO, too. Of course, we know who the Rangers and Aragorn and Gandalf are, but just because Barliman Butterbur doesn't know doesn't mean we aren't "besties" with some major characters in Middle-earth. And the Elf starter zone in LOTRO has all sorts of Dwarves and Elves who are bigwigs in Middle-earth. So yeah, it's a bit odd in parts, but almost ridiculously so in ESO. I kept wanting someone over at Bethesda to step in and tell Zenimax that maybe, just maybe, this is going to far to fast with your toon's elevation to hobnobbing with the powerful and famous. I think I mentioned it in one of my earlier posts about ESO, but I do tend to interrupt the voice actors because having all the text there to read, I usually read it faster than they speak and then want to move on. I'm confused about your mention of companions... are there talking companions in ESO? I never got far enough in LOTRO to notice anything odd there. Plus while people like Gandalf may be important, he's also canonically known to enjoy hanging out with random individuals (hobbits!) so it would seem less jarring to have him do so in game. I probably don't know enough about important dwarves and elves to even recognise them, heh. Finding those tidbits of dialogue scattered around SWTOR trained me to go on foot as much as I can. I thought the H to call a mount was counter-intuitive too. Luckily second nature now, though I'm often just running along roads on foot looking for herbs, treasure chests, cloth and metals. I've only recently really come to enjoy the game. It helped to try out different classes and just use the Advised settings for builds. You can always re-do your skills later, and I've found myself doing that with most characters. New characters go to Summerset now, but if you have a single character who has landed in Auridon and has the Mara's Kiss Public House (free) all of your characters can hop over there anytime free. From there, you can go many places, but the two "starter areas" I liked best were Bleakrock Isles (go to docks in Vulkhel Guard and take a boat to Stonefalls, then Bleakrock Isle) and Stros M'Kai (Vulkhel Guard boat to Daggerfall, take a boat from there to Stros M'Kai.) Summerset Isles are ok, but not my favorite area. At this time I think I like Stonefalls and Glenumbra best. The daily rewards are actually useful in this game. Foods, both created by you and looted from various bandits are super helpful. Glenumbra is very much a stereotypical Fantasy type zone, I've noticed, and Auridon nearly so. Stonefalls is quite different, as in "your initial areas are near Mt. Doom" type of different. The thing that amused me about the H for horse was that they made a point of telling me to check out my collections, how I could collect different mount skins etc. but not how to use them. It just seemed like a very glaring "missing the forest for the trees" thing (unless I missed a mention of it somehow). For all the little niggles I've mentioned in this post, not liking the zone I'm in is not one of them. The quests are entertaining enough and the environment is very pretty. I like that. Oh, and about daily rewards, it's not really an issue for me whether they are useful or not... and they do in work on me to some extent, because I've logged in for several more days since that play session purely do utilise some of those daily cooldowns I mentioned. The problem is that this "need" to log in can quickly backfire when I don't particularly feel like playing, to the point where it makes me want to actively get away from the game and its "needy" chores. The prophet annoys you after every quest because back when the game launched the main story quests would unlock every five levels. Then when they launched One Tamriel they boosted everyone to max level so you could go to any zone any time and do any quest. A side effect is the main quest can now be done back to back to back and completed by level 15 if you want to. For a first play through following the skill advisor is a safe way to go for picking skills and passives. I was wondering if it was related to One Tamriel, though I didn't think it was going to be that drastic! Just as well that I allowed myself to be distracted by side quests then; I think actually finishing the main storyline at level 15 would have felt somewhat anticlimactic! The lore explanation for "Vestige" as a title is that Molag Bal stole your soul, leaving you merely a vestige of a person. This is supposed to be your motivation for fighting him. I always thought it was a pretty poorly executed plot point as it's never clearly explained what the actual effect of having no soul is, and in fact the only change it appears to cause is that you can't really die now, so it kinda seems like a good thing? But that's the story. As pointed out above, there's an in-game skill advisor as part of the new level-up system that will tell you how to spend your points if that's what you want. I'm a bit surprised you haven't encountered it. It's usually turned on by default. Regarding the Aldmeri quests, it's been a long time since I played through it, but I think part of the point of being an Eye of the Queen is that you're an undercover operative, so being promoted straight from nobody to Eye kind of makes sense in that context. Eyes are supposed to be ordinary people, or be able to pass as such. I do feel you on not quite connecting with the game even when it feels like you should. On paper it's incredibly similar to TSW, so in theory I should love it, but even though I did make it to level cap (on multiple characters now), it's never quite excited me like I feel it should. Not really convinced by your explanation for the Eye of the Queen, since she does say something about how they are the ones she trusts the most or something like that... still very over the top for someone you only just met. Just wanted to say a general thanks to everyone who left nice and/or helpful comments on this post. I was a bit worried some players might be taking offense at my poking fun at the game but fortunately that was not the case. I've been logging in more for the past couple of days and finally decided to pony up for a month of ESO Plus. We'll see where it goes!